Batman V Superman may have sucked at the cinema, and Gotham grinds away on the small screen, but videogames are proving once again to be where Bats belongs. After the Arkham games laid claim to the medium's greatest superhero franchise, Telltale was the perfect choice to bring Batman back. The point-and-click revivalists know comics, for one, having made their name with a brilliant pair of Walking Dead games that were tied to print (not TV), as well as The Wolf Among Us, a prequel to cult indie comic Fables. And their episodic release schedule pairs well with comicdom's inherent serialization. They also clearly remember that Batman debuted way back in 1939 in a title called Detective Comics, and that's where they've decided to differentiate their efforts. 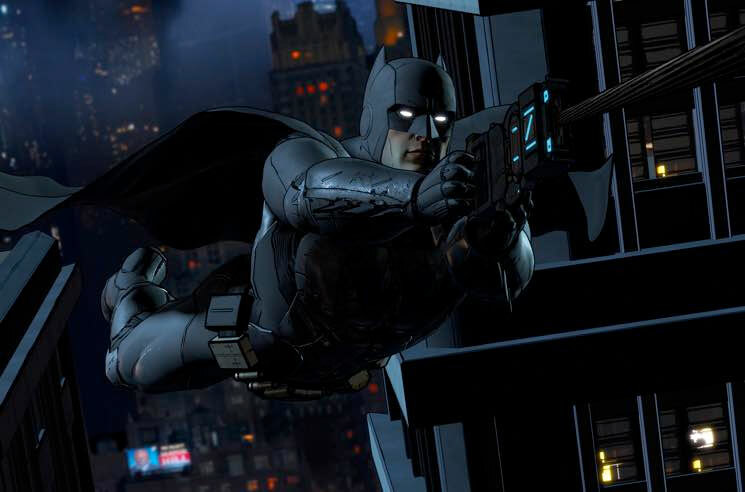 While the Arkham gameplay focused primarily on combat, stealth and open-world exploration, Telltale spins a story about the Dark Knight Detective. There's still quick-time combat, but the game is defined by its crime-solving mechanics, which work well with the studio's old-school adventure game mechanic. It's a technique they honed on their Fables game, which centered on Sheriff Bigby Wolf's murder investigation. My review last year of Arkham Knight hoped that "In the wake of Christopher Nolan's humourlessness infecting the entire DC Cinematic Universe, it would be nice to see the next Batman game ditch the grotesque grim-dark shtick… and go for a more stylized film noir." There is still some grotesquery on hand — this isn't kid-friendly, so keep far away from any young'uns Netflixing The Brave and the Bold — though much is left up to your personal gameplay decisions, which in turn affect how others view your Batman. But first episode Realm of Shadows definitely digs deeply into noir for its style and story. The hand-drawn aesthetic, inspired by legendary DC artists like Jim Lee and Neal Adams, provides a perfect complement to the source material, making it feel like a comic come to life rather than trying to emulate celluloid. The branching, non-canon story, set early in the character's timeline, pays more attention to Bruce Wayne than to Batman, and is very interested in dealing with the psychology behind his dual identities. It's also interested in endemic political and corporate corruption, and organized crime over supervillainy. So far, the big bad is mob boss Carmine Falcone, instead of the usual rogues gallery (though Catwoman comes in early and district attorney Harvey Dent is running for mayor, with Wayne's financial support).